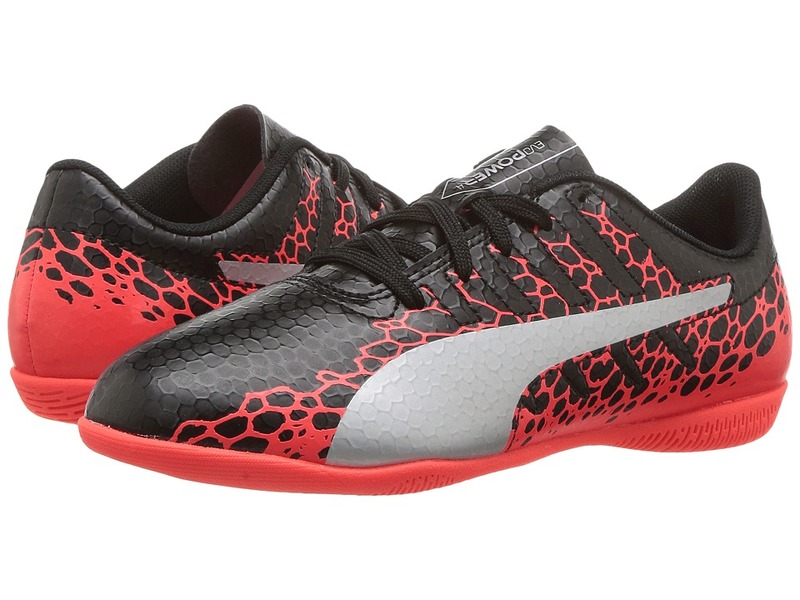 His footwear matches his speed of play in the speedy vibes of the PUMA evoSPEED Star S2 shoe! Indoor soccer shoe silhouette. 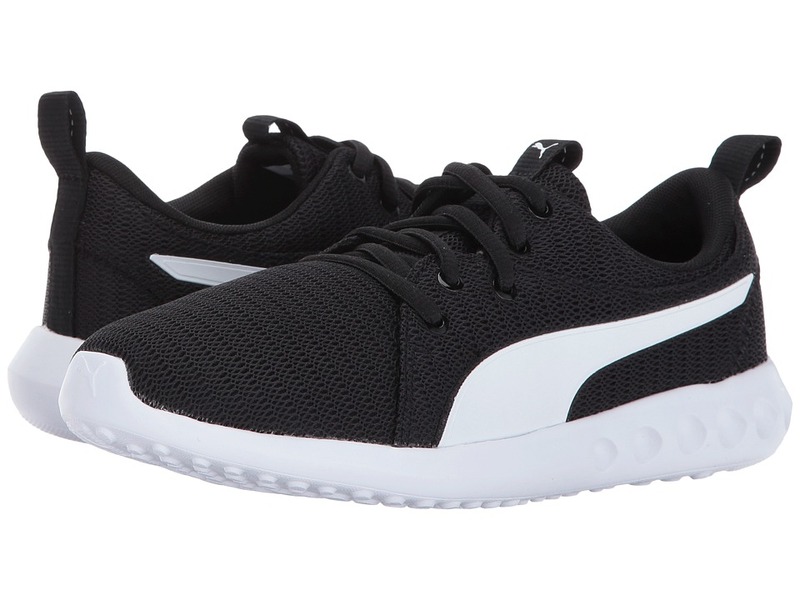 Synthetic leather upper offers a sleek look. Lace-up closure. PUMA Cat logo adorns tongue. Contrast PUMA Formstripe at lateral side. Padded collar and tongue for comfort and support. Breathable fabric lining. Removable foam sockliner. IGNITE foam midsole delivers exceptional response and energy return. Non-marking rubber outsole for long-lasting wear. Imported. Measurements: Weight: 5 oz Product measurements were taken using size 2 Little Kid, width M. Please note that measurements may vary by size. Weight of footwear is based on a single item, not a pair. 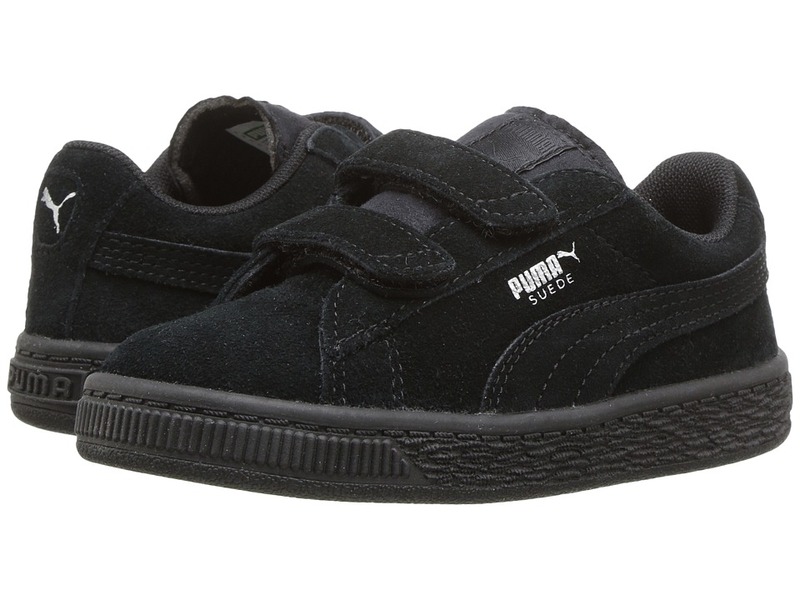 Take them back to the old school with the classic style of the Puma Kids Suede 2 Straps shoe! Uppers of durable suede. Dual-strap hook-and-loop closure for easy on and off. Removable Kinder-Fit sockliner for cushioned comfort. PUMA Formstrip at medial and lateral sides. Non-marking rubber outsole for long-lasting durability. Imported. Measurements: Weight: 5 oz Product measurements were taken using size 8 Toddler, width M. Please note that measurements may vary by size. Weight of footwear is based on a single item, not a pair. 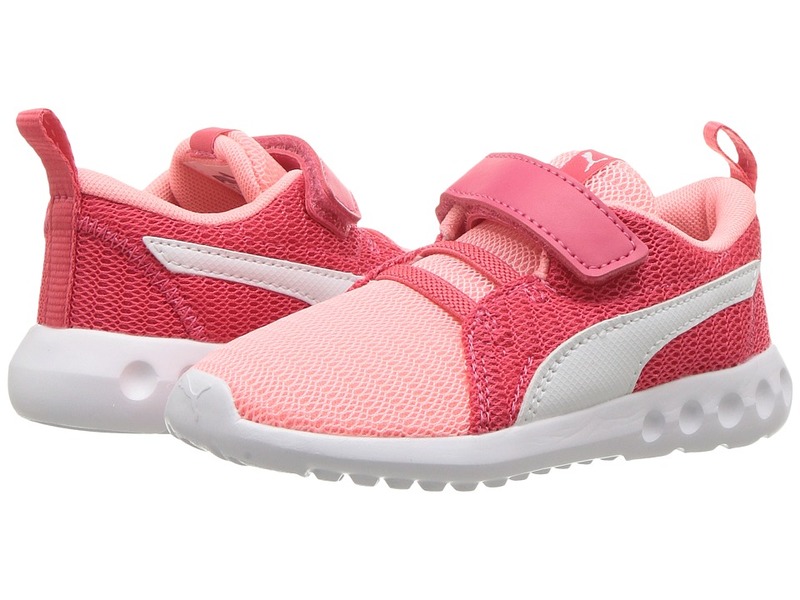 Style meets performance in the versatile, sleek design of the Puma Kids Carson 2 shoe! Uppers of durable faux leather. Lace-up closure. Padded tongue and collar. Pull-on tab at heel for easy on and off wear. Removable Kinder-Fit sockliner. EverRide blown rubber outsole provides daylong cushioned comfort, while EverTrack material in high-wear areas supplies lasting durability. Imported. Measurements: Weight: 5 oz Product measurements were taken using size 6 Big Kid, width M. Please note that measurements may vary by size. Weight of footwear is based on a single item, not a pair. 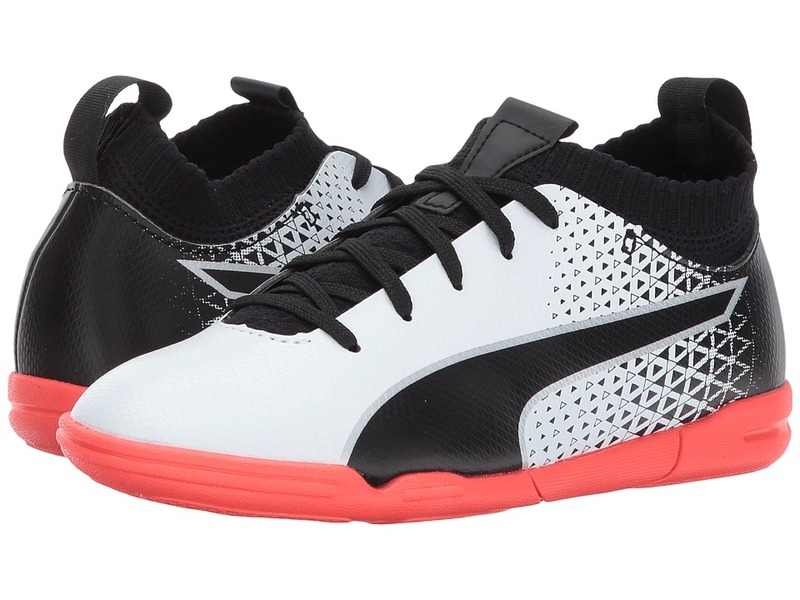 Style meets performance in the versatile, sleek design of the Puma Kids Carson 2 shoe! Textile mesh upper offers breathable wear. Lace-up closure. Padded tongue and collar. Pull-on tab at heel. Removable Kinder-Fit sockliner. EverRide blown rubber outsole provides daylong cushioned comfort, while EverTrack material in high-wear areas supplies lasting durability. Imported. Measurements: Weight: 3 oz Product measurements were taken using size 2 Little Kid, width M. Please note that measurements may vary by size. Weight of footwear is based on a single item, not a pair. 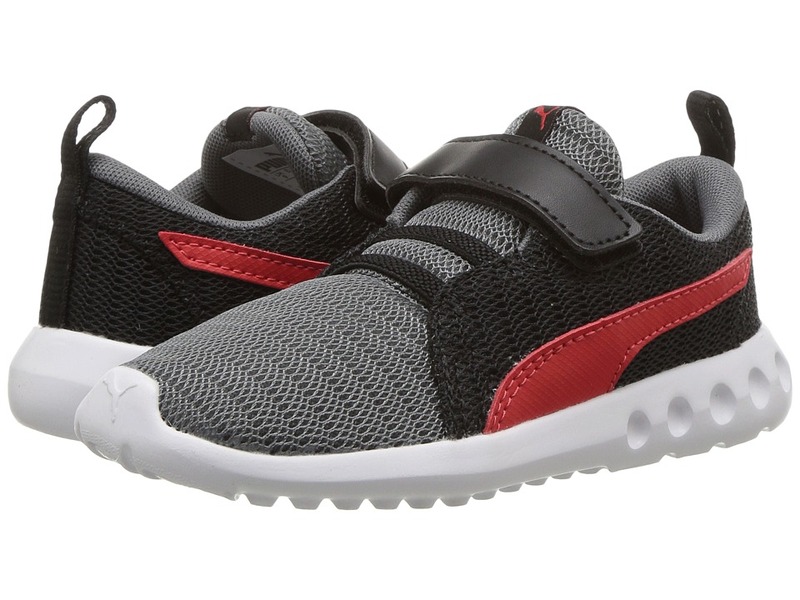 Style meets performance in the versatile, sleek design of the Puma Kids Carson 2 V shoe! Uppers of breathable textile mesh. Hook-and-loop closure for a secure fit. Padded tongue and collar. Pull-on tab at heel for easy on and off wear. Removable Kinder-Fit sockliner. EverRide blown rubber outsole provides daylong cushioned comfort, while EverTrack material in high-wear areas supplies lasting durability. Imported. Measurements: Weight: 2.2 oz Product measurements were taken using size 9 Toddler, width M. Please note that measurements may vary by size. Weight of footwear is based on a single item, not a pair. 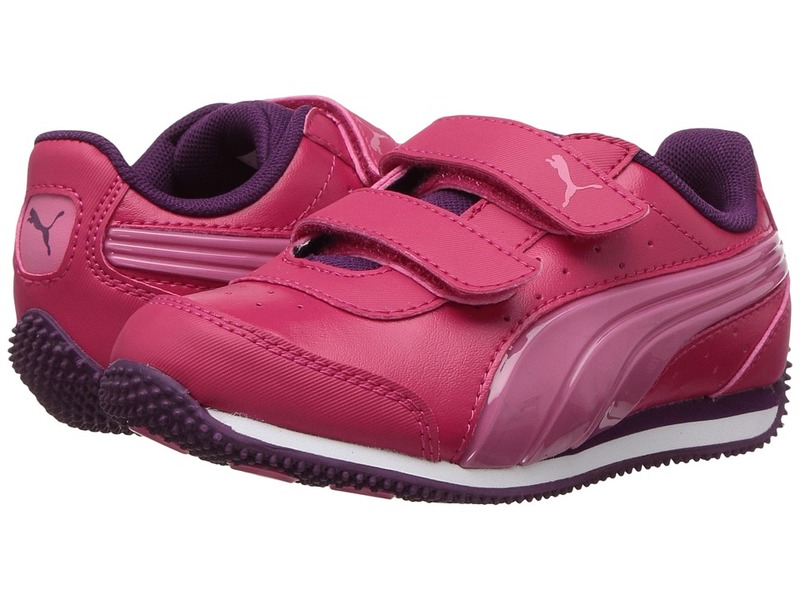 Style meets performance in the versatile, sleek design of the Puma Kids Carson 2 V shoe! Uppers of breathable textile mesh. Hook-and-loop closure with fixed laces for a secure fit. Padded tongue and collar. Pull-on tab at heel for easy on-and-off wear. Removable Kinder-Fit sockliner. EverRide blown rubber outsole provides daylong cushioned comfort, while EverTrack material in high-wear areas supplies lasting durability. Imported. Measurements: Weight: 2 oz Product measurements were taken using size 8 Toddler, width M. Please note that measurements may vary by size. Weight of footwear is based on a single item, not a pair. 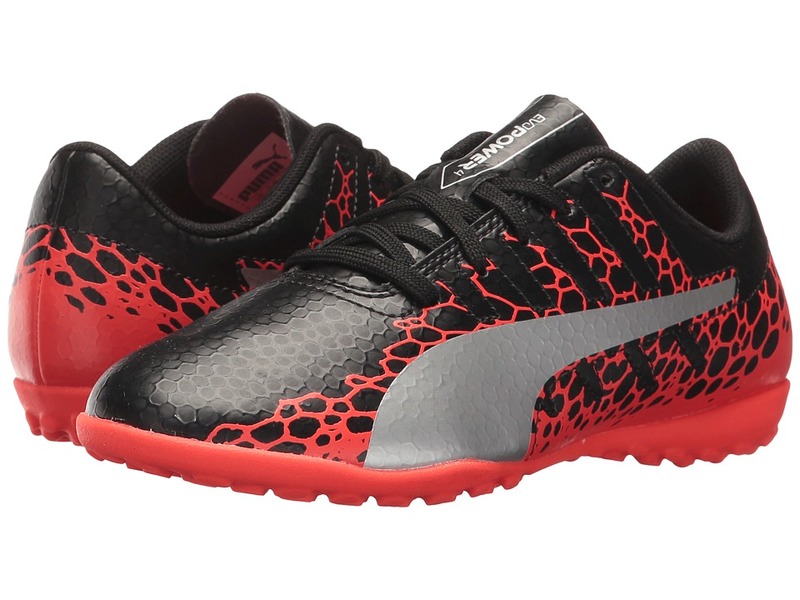 Add some extra oomph to their style with the vibrant Puma Kids Speed Light Up Power V shoe! Durable synthetic upper features perforations for breathability. 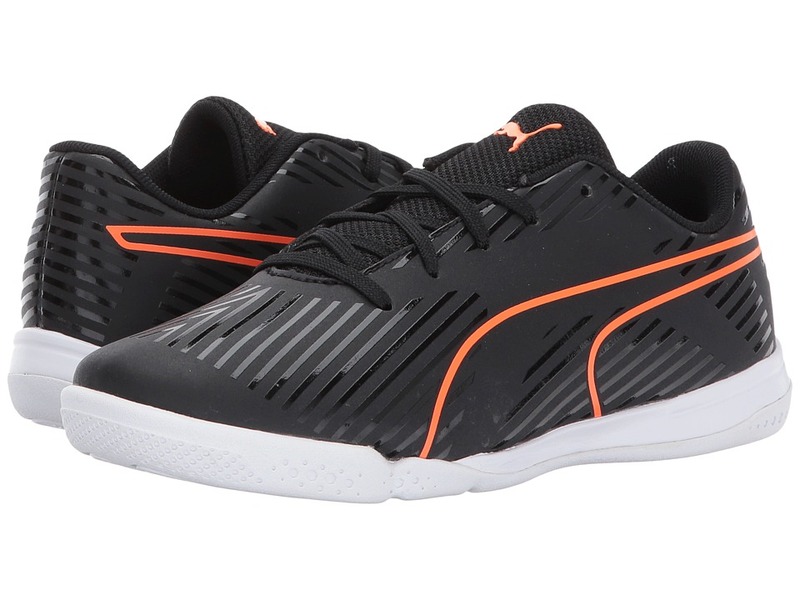 Lateral PUMA Formstrip logo lights up as your heel strikes the ground. Stitching elements provide durability and a unique look. Dual hook-and-loop closure ensures a snug fit. Lightly padded tongue and collar. Smooth textile lining for all-day comfort. Cushioned footbed is constructed from comfy textile. EVA midsole for lightweight cushioning. Durable rubber outsole with nubbed traction pattern. Imported. Measurements: Weight: 4 oz Product measurements were taken using size 10.5 Little Kid, width M. Please note that measurements may vary by size. Weight of footwear is based on a single item, not a pair. 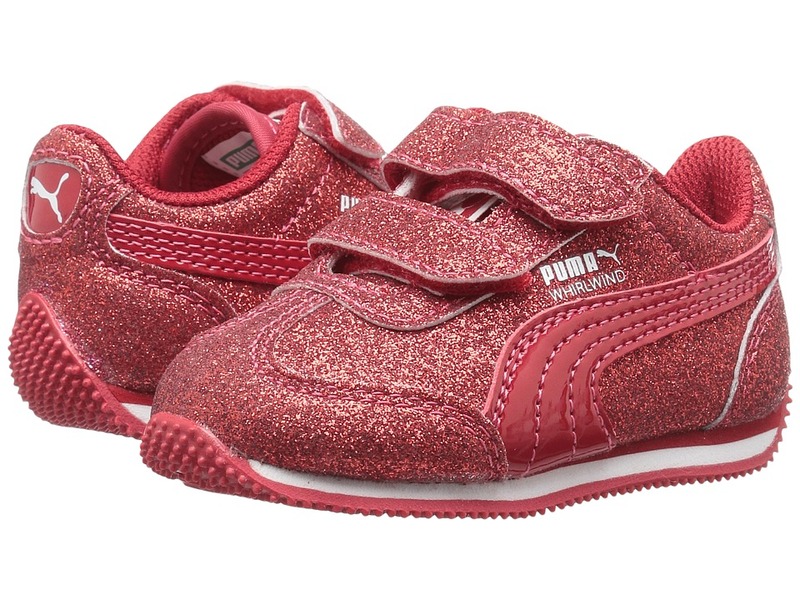 Keep sparkling style on their feet with the fun Puma Kids Whirlwind Glitz V shoe! Synthetic suede and textile upper. Allover glitter detailing for dazzling style. Dual hook-and-loop closure for easy on and off. Padded collar for added comfort and stability. PUMA logo at tongue, side, and heel. PUMA formstrip at lateral sides. T-toe construction provides reinforcement. Cushioned footbed. Kinder-Fit sockliner and cushioned EVA midsole for optimum comfort. Aggressive rubber lug outsole. Imported. Measurements: Weight: 5 oz Product measurements were taken using size 2 Little Kid, width M. Please note that measurements may vary by size. Weight of footwear is based on a single item, not a pair. 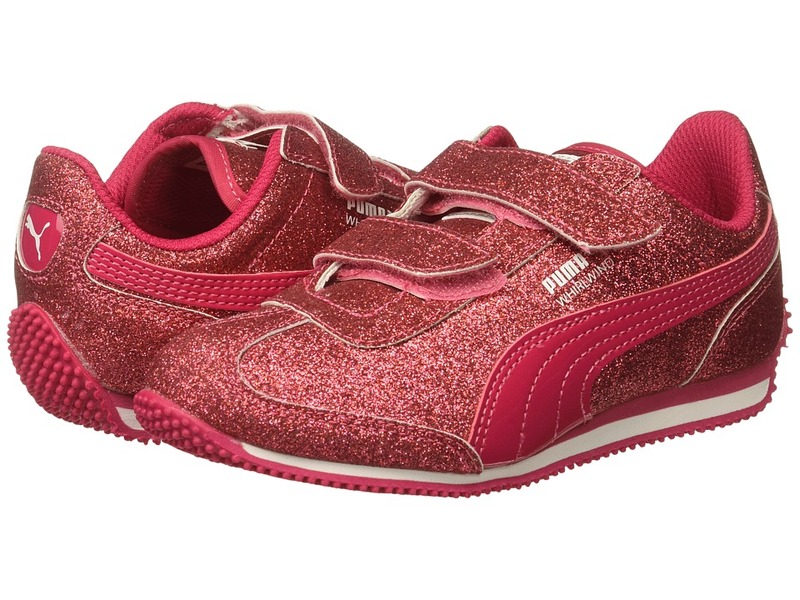 Keep sparkling style on their feet with the fun Puma Kids Whirlwind Glitz V shoe! Synthetic suede and textile upper. Allover glitter detailing for dazzling style. Dual hook-and-loop closure for easy on and off. Padded collar for added comfort and stability. PUMA logo at tongue, side, and heel. PUMA formstrip at lateral sides. T-toe construction provides reinforcement. Cushioned footbed. Kinder-Fit sockliner and cushioned EVA midsole for optimum comfort. Aggressive rubber lug outsole. Imported. Measurements: Weight: 3 oz Product measurements were taken using size 9 Toddler, width M. Please note that measurements may vary by size. Weight of footwear is based on a single item, not a pair. Classic style meets modern swagger with the fun Puma Kids Suede Heart SNK shoe! Low-profile silhouette. Textile lining for breathable wear. Oversized laces provide a unique, stylish look. Padded footbed offers cushioned comfort. 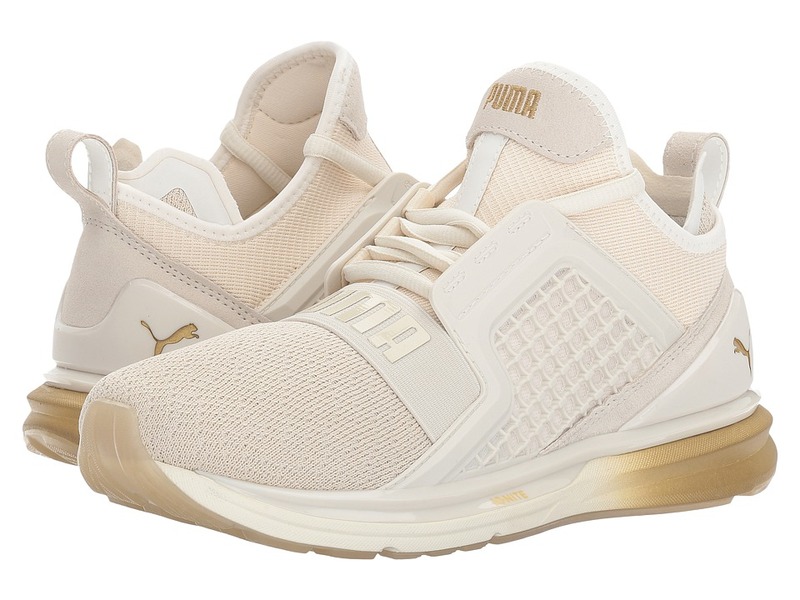 Puma Formstripe detailing. Rubber outsole for long-lasting durability. Imported. Measurements: Weight: 12 oz Product measurements were taken using size 7 Big Kid, width M. Please note that measurements may vary by size. Weight of footwear is based on a single item, not a pair. Classic style meets modern swagger with the fun Puma Kids Suede Heart SNK shoe! Low-profile silhouette. Textile lining for breathable wear. Oversized laces provide a unique, stylish look. Padded footbed offers cushioned comfort. Puma Formstripe detailing. Rubber outsole for long-lasting durability. Imported. Measurements: Weight: 9 oz Product measurements were taken using size 2.5 Little Kid, width M. Please note that measurements may vary by size. Weight of footwear is based on a single item, not a pair. Classic style meets modern swagger with the fun Puma Kids Suede Heart SNK shoe! Low-profile silhouette. Textile lining for breathable wear. Oversized laces provide a unique, stylish look. Padded footbed offers cushioned comfort. Puma Formstripe detailing. Rubber outsole for long-lasting durability. Imported. Measurements: Weight: 6 oz Product measurements were taken using size 8 Toddler, width M. Please note that measurements may vary by size. Weight of footwear is based on a single item, not a pair. Luxe detailing, bold style, and aggressive dimensions make the Puma IGNITE Limitless Metallic shoe a true game changer! 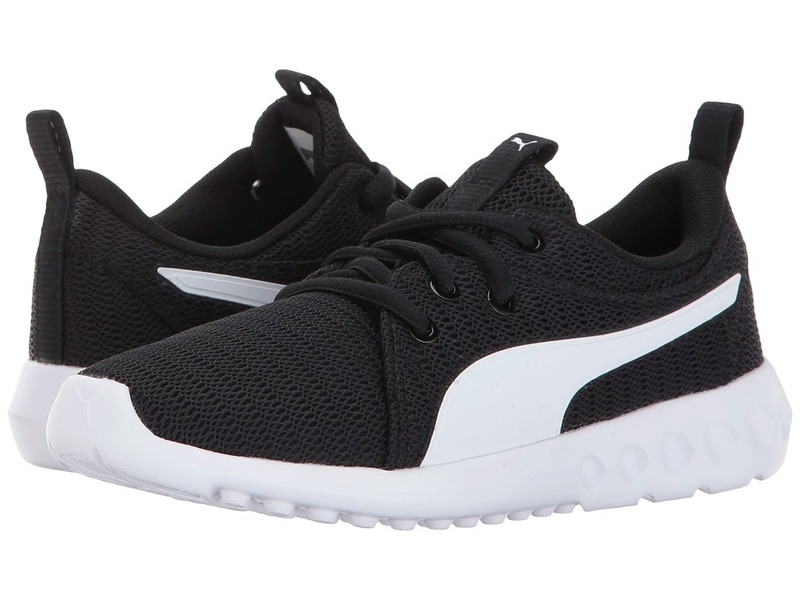 Features breathable, color blocked, four-way stretch Ariaprene fabric uppers. Clamshell construction with a TPU Kurim midfoot cage for maximum protection and durability. Bootie construction in a sporty, ankle-high silhouette. Lace-up closure with an elastic band at top-of-foot. Easy pull-on style with a heel tab. 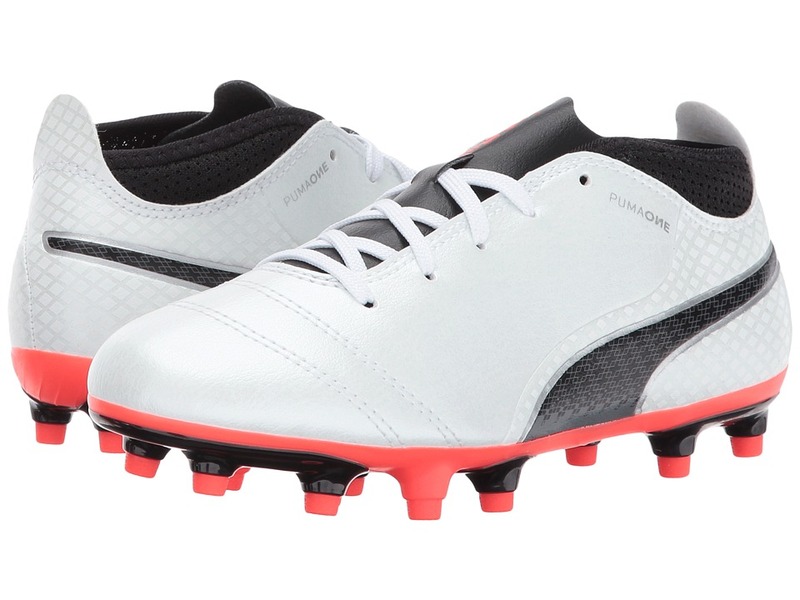 Offers a carbon-fiber heel clip and ballistic stretch strap at forefoot with PUMA branding. Injection-moulded EVA at midsole for lightweight performance. IGNITE Foam for superior energy return. Reflective details for night visibility. Features a crystal rubber outsole with full contact traction control. Imported. Measurements: Weight: 11 oz Product measurements were taken using size 8.5, width B - Medium. Please note that measurements may vary by size. Weight of footwear is based on a single item, not a pair.